Recycling felted wool, yes please. 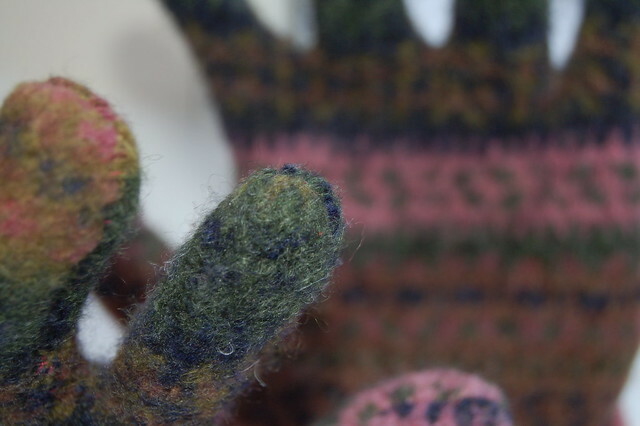 From the same felted sweater that I made my mom’s mittens I cut out a new pair of finger gloves for myself. I brought them home with me un-sewed, but now I have hand sewn the parts together. They are a bit funny looking, but they fit me! I love sewing in felt. I wish I’d fall into a whole bag of cheap wool sweaters in great colours like these! Pink and green stripes, could it be any better? I like the result, even though they are a wee bit to tiny here and there. I think they will stretch some if I start to use them. And I will. Now. This entry was posted in Fabric & Sewing and tagged mittens, pink and green, recycling, wool. Bookmark the permalink. Great idea, these look amazing! I’ve got a few sweaters in the lurch, waiting to become new items. It never occurred to me to consider gloves–brilliant! very cool, and you are right, the color combo is perfection! Wow these are great! I keep searching when I’m thrifting for the perfect jumper to felt and I haven’t found one yet. I will have to just go for it soon with any old jumper. 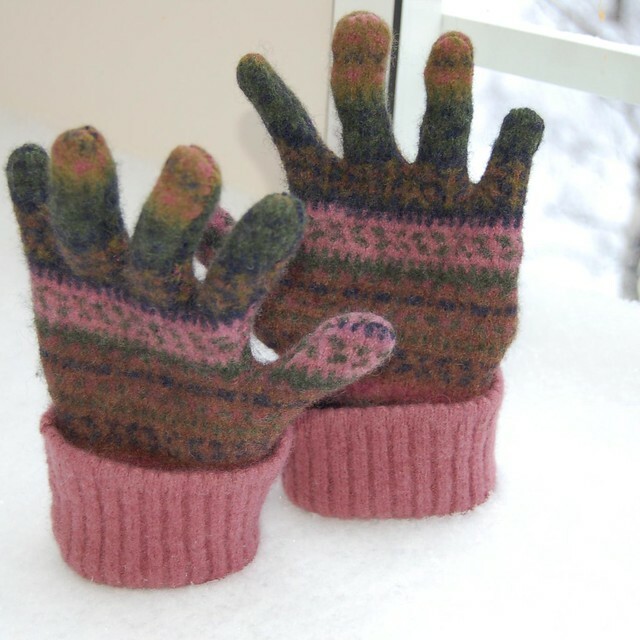 I would never think of making gloves, such a good idea! ok, I felted a sweater that has been sitting on a shelf in my closet for years. Now I just need to work up the nerve to put the scissors to it. I am thinking that I can do the mittens from the sleeves, and maybe a hat or pillow for the lower edge. I don’t want to waste any of it. This is such a clever idea! I am kicking myself, I just tossed some old Benneton wool sweaters that I’ve been holding since we moved to warmer climate (ten years ago – it’s time to get over it!). It hardly ever gets cold enough here to wear wool, but they would have made beautiful mittens. Such a lovely gloves, so funny, and darling, perfect ribbing edge!! These are so cool, what a great sweater to work with! I love the cuffs and the way the pink stripe extends to the thumb! The gloves are so cool! oh my gosh, this is soooo cool. What else have you made with wool sweaters? I want to do that! !